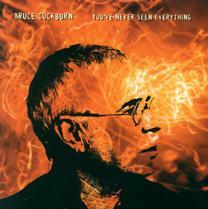 George Graham Reviews Bruce Cockburn's "You've Never Seen Everything"
In a period enjoying a bumper crop of new-generation singer-songwriters, there are few artists who have managed to stay as fresh, interesting, and downright edgy over a more than 30-year career than Bruce Cockburn. The Canadian folkie emerged with his debut recording in 1970, and is now up to his 27th album with his new release You've Never Seen Everything. Initially starting as a rather pastoral artist combining some lyrical images of nature with fine finger-picked guitar work, honed from his studies at the jazz-oriented Berklee College of Music, Cockburn has released a continuing series of recordings that gradually gained in popularity south of the Canadian border, and at the same time evolving his bucolic lyrical images into strong pleas for the environment and other progressive causes. In 1979, he enjoyed a hit with Wondering Where the Lions Are, and later the more provocative If I had a Rocket Launcher, written in the midst of the Reagan-era Central American exploits. While his music and especially lyrics have had difficulty finding a place on the commercial, corporate media, his fans worldwide remain loyal, Cockburn himself continues to explore new directions, including more jazz, drawing on his earlier influences, and world music. His lyrics have remained philosophical and in keeping with his political activism for such causes as the environment, the banning of land-mines and resistance to corporate control in the Third World. But he tempers that on the new album with such song titles as Don't Forget About Delight. Like an increasing number of artists, Cockburn finds the current political climate fertile ground for songs taking on globalization, plutocratic economic policies, genocide in Cambodia, and various assorted outrages reported in the news. But Cockburn also has made this perhaps his most jazz-influenced recording yet, with a collaboration with jazz pianist Andy Milne and Swiss harmonica player Gregiore Maret. He also moves toward a decidedly contemporary direction with some drum loops and distorted sounds, and even something approaching about as close to hip-hop as a Canadian folkie is likely to get. This is his first new studio album in four years, with an accumulation of songs written over about the past three years, and it turns out to be his most fascinating recording in perhaps a decade. The confluence of musical influences is impressive, and it all comes together rather well, and does not sound eclectic just for the sake of mixing it up. Cockburn's lyrical passion is palpable. He expresses the outrage so many have felt with the current political priorities. For this CD, Cockburn is joined by an interesting and diverse supporting cast, including backing vocals from fellow activists Jackson Browne, Emmylou Harris, and Sam Phillips, as well as up-and-coming folksinger Sarah Harmer. In addition to the keyboards of jazzman Milne, Hugh Marsh is heard on violin. Marsh was a regular on Cockburn's recordings during the 1980s. Appearing on a few tracks is Tom Waits' rhythm section of drummer Stephen Hodges and bassist Larry Taylor, who himself goes back to being a member of the Woodstock band Canned Heat. Also heard on drums are Gary Craig and Ben Riley. Other bassists include John Dymond and Steve Lucas. Cockburn himself performs on the various acoustic and electric guitars. The music is occasionally interspersed with the songs of frogs from Zambia recorded by a friend working with the group Doctors without Borders. The sound of the CD is about as dark as the mood, but musically and lyrically there are lots of interesting things going on. Serving as producer again for Cockburn is a long-time collaborator, fellow Canadian Colin Linden. By 33 years into his recording career, one would think that an artist could afford to kick back and give his fans more of what they want, and perhaps play the oldies. Bruce Cockburn says that one of his fears is repeating himself. He calls it a "phobia" and adds that he operates under the possibility that he might never be able to make another album or write songs after the current ones. This effort to avoid stagnation has made Cockburn one of the most consistently creative and articulate artists in the singer-songwriter field, long after many others of his generation have lost their edge. His new CD You're Never Seen Everything is one of his most incisive recordings yet, full of lyrical power, and musical experimentation and exploration. But he manages to temper his frustration with the state of the world with some poignant calls for optimism. The only problem with the CD is in its sound quality. For a grade, we'll be charitable to give it a "C." Similar to the sonic dumbing down that is part of the very corporate culture Cockburn decries, the CD is very heavily compressed to the point that Cockburn's vocals are sometimes distorted. The recording is always in your face like a commercial, even when it tries to be more laid back and acoustic in sound, so it has a noisy but very flat, two-dimensional quality. It's too bad the CD was spoiled this way. Sonic compromises notwithstanding, You've Never Seen Anything is solid proof that the singer-songwriter as social observer is very much alive, and Cockburn remains one of the best.